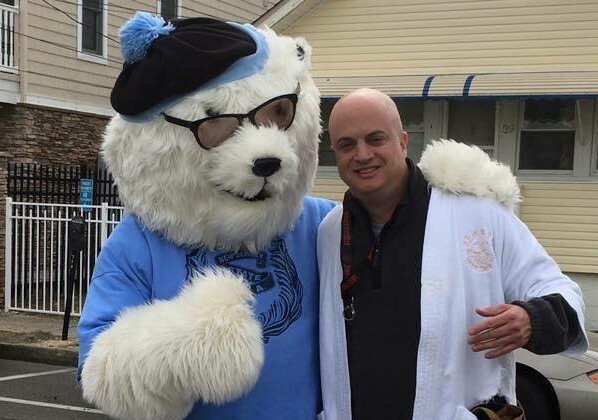 This month, Palmyra resident Brian O’Sullivan will plunge into the freezing Atlantic Ocean to support a cause that means a lot to him — Special Olympics New Jersey. O’Sullivan started taking the annual plunge in 2014, and this year, he’ll do it on his 45th birthday. New Jersey’s Polar Bear Plunge, whose slogan is “Freezin’ for a Reason,” is a dip into the Atlantic Ocean in the winter months to raise money for charities. Participants typically must raise at least $100 for the Special Olympics New Jersey to participate. Special Olympics provides leadership opportunities, sports training and health screenings to more than 25,000 athletes with intellectual disabilities. The organization is dedicated to bringing pride into the lives of all involved with the Special Olympics. O’Sullivan says the first year he participated, he was taken aback by how cold the water was. Despite the initial shock, he took the plunge twice that day. “I had no idea what I was going into, but it’s once a year. I can endure a little coldness,” O’Sullivan said. The first year O’Sullivan did the Polar Bear Plunge, he raised $500. The following year, he doubled that and raised $1,000, and last year he raised $1,200. This year, O’Sullivan is setting his sights on raising $1,999. “If I can raise $100, that’s great. If I can raise $1,999, that’s even better,” O’Sullivan said. O’Sullivan has raised more than $600 this year, most of which has come from online fundraising. In December, O’Sullivan ran his annual “letters from Santa” campaign that raised $300 toward his goal. For a $5 donation, O’Sullivan wrote personalized letters to children and signed by Santa. Once he wrote the letters, O’Sullivan sent them off to North Pole, Alaska, to be mailed back to the child and postmarked from the North Pole. “When you’re that young, you still believe in miracles,” O’Sullivan said. O’Sullivan says the Special Olympics is his charity of choice because he loves doing things to make other people happy, and the Special Olympics does just that. “They’re just people and kids, and this is something that they can do. It’s nice to see people enjoying themselves,” O’Sullivan said. O’Sullivan says his New Year’s Resolution was to do one act of kindness each day, whether big or small. Some days it’s dropping donated blankets off at the local food pantry, other days it’s sharing a funny picture on Facebook to put a smile on somebody’s face. O’Sullivan’s main goal is to help people whenever he can.